Charlotte Elizabeth Beattie is my maternal great grandmother. Born in Jul 1869, she was the youngest of nine children born to James Beattie and Rebecca McCadden of Co. Donegal. 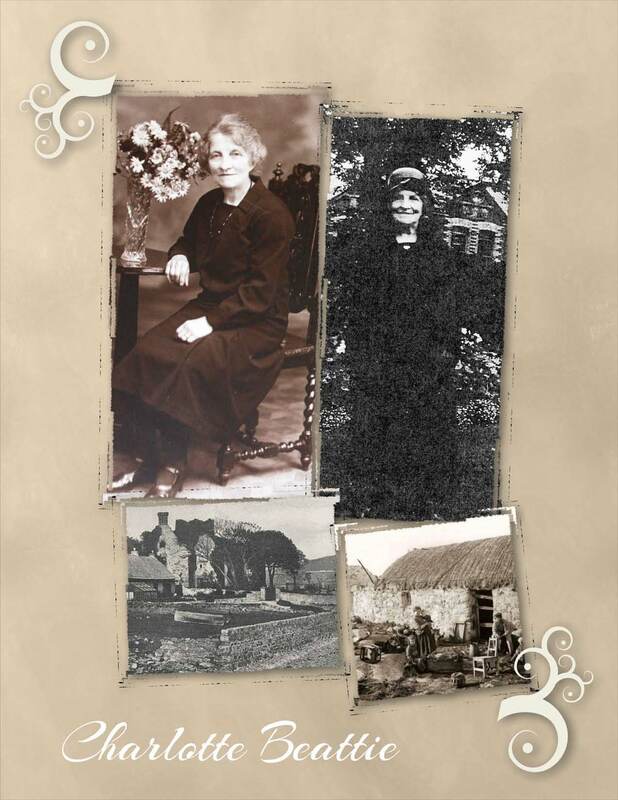 Her father and my 2nd great grandfather, James Beattie; was born in Letterkenny, Co. Donegal. Unfortunately, I know very little about this particular “twisted limb” in my family tree prior to James. As I have been unable to find neither birth nor death records for him; and since he died prior to the 1901 census being taken; all I can do is make an educated guess regarding his age. So, for the moment I’m working with his birth year being about 1830. On 2 Mar 1855 Rev. 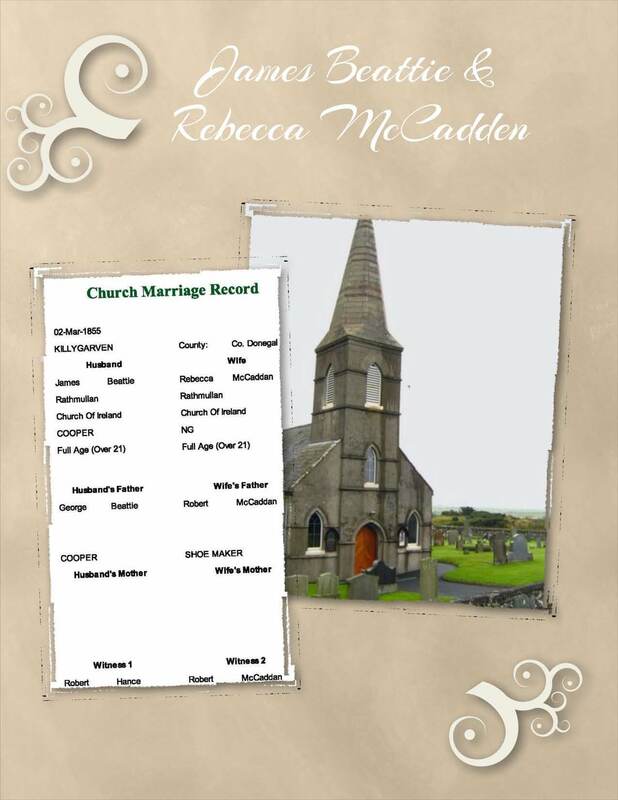 H. Ferguson officiated the wedding of James to Rebecca McCadden in the Rathmullan Church of Ireland. Their marriage record shows that both were residing in Rathmullan at the time. Robert Hance & Robert McCadden were witnesses to their wedding. The records also show that George Beattie was the father of James; and both were Coopers by trade. A Cooper is a maker or repairer of casks & barrel. The same source shows that Robert, who was a shoemaker; was Rebecca’s father. My question at this point would be; was the witness named Robert McCadden Rebecca’s father OR was he a brother also named Robert? I do know that James had a brother named Samuel. James and Rebecca had nine children, comprised of five sons and four daughters. 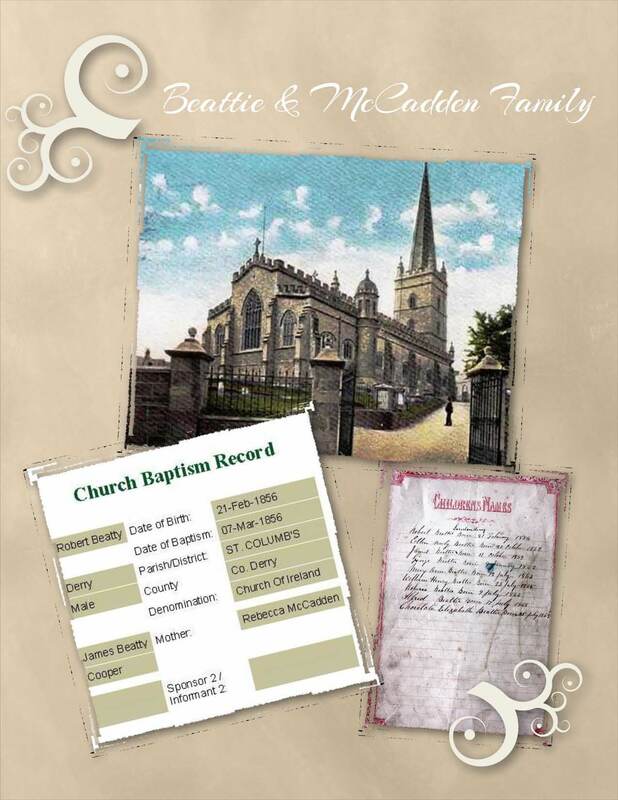 The baptism of their first son Robert on 7 Mar 1856 at St. Columb’s Cathedral confirms the family was living in Londonderry at the time. This might suggest that they moved to Londonderry shortly after their marriage. So, now I know that my 3rd great grandfathers were George Beattie & Robert McCadden. Unfortunately, I do not know the names of my 3rd great grandmothers in this particular “crooked branch” of my tree. As always, more information to search for; the never ending saga of my “Twisted Limbs & Crooked Branches”! 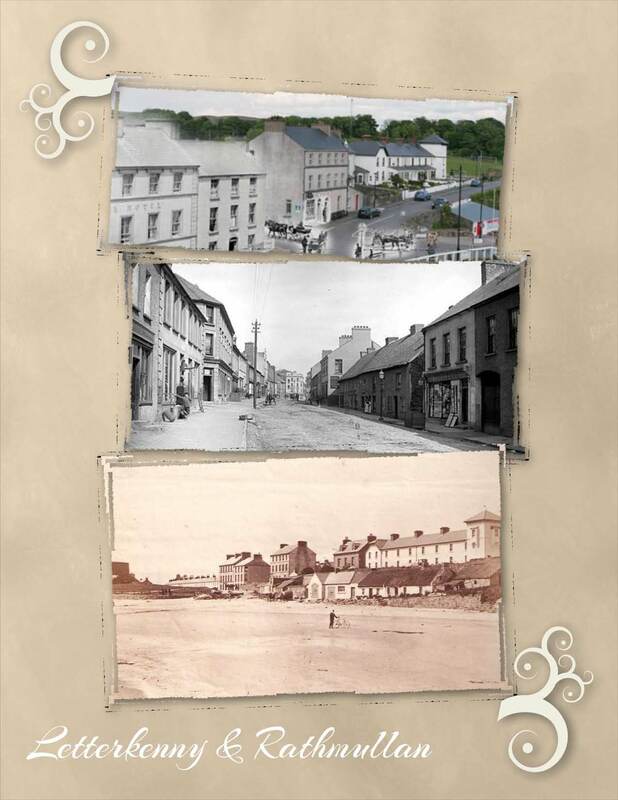 This entry was posted in Co. Donegal, Co. Londonderry, Family History, Geneaology and tagged Beattie Family - Maternal Line, Beautiful Places, Chambers Family, Co. Donegal, Co. Londonderry, Family History, Genealogy; Ireland; Records, McCadden Family. Bookmark the permalink. I love the way you integrate such beautifully presented images into your stories. It makes them even more pleasureable to read. A 4x great!!! That’s brilliant; I’m lucky if I have a first name for my 4ths! 😦 That’s where “hanging out” in cemeteries is going to be beneficial to me! Hopefully that is! Have a great day! Irish records are notoriously slim aren’t they? I have friends with Irish ancestry who get quite envious of their Scottish cousins. I’m really fortunate to have almost exclusively Scots forebears. Having said that, I’m not likely to get much further back because mostly my ancestors weren’t landed so the only records are Parish ones, and they only started in the 17th century and then only in some parishes. Oddly, the most difficult people I’ve found to research have been the most recent ones where records haven’t been released yet. And I hope your daughter does get to Queens; such a great opportunity for you (I mean her 🙂 )! !